When I am talking to customers about plants or gardening and the word “pruning” comes up, I generally get one of two responses. Some people will shake their heads in disgust at the mere utterance of the word while some display a deranged, bewildered look of sheer pleasure. They can not wait to get home, fire up the hedge trimmers (or worse…….a chainsaw) and begin to butcher some innocent, unsuspecting shrub or tree. Somewhere in the middle of these two reactions lies an appropriate attitude, or appreciation or pruning. It will be impossible to cover all aspects of pruning in this article, so we will hit the high spots. A deranged branch is considered one that is growing completely out of place, or in a random direction from other branches. Removing a dead branch creates an opportunity for new growth while removing diseased branches can prevent the spread of disease. Remember the three D’s and feel free to prune whenever necessary. There are three basic pruning methods that are frequently used in gardening. Each technique is used for different desired results. Heading back is a popular method of pruning to control the size of plant material. I see heading used frequently for hedging shrubs and keeping foundation plants at a desired height. Heading can be accomplished by using hand pruners, shears, or electric trimmers. In most cases, no more than one third of the growth or a tree or shrub should be removed at one time. Heading can be performed at many different times of the year. Late February is the best time to prune using this method if a significant portion of the plant is going to be removed. Light shearing and “hair cuts” can be done at any time during the spring and into mid-summer. Any pruning after the summer months can influence the plant to add new growth which will not be hardy enough to survive the first frosts and freezes of the fall season. 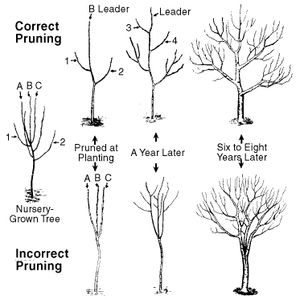 Thinning is another method of pruning that many people do not know about, or understand how to utilize. It differs from heading in that the cuts are made down, towards the base of the plant as opposed to the tips of the branches. This is a great practice to understand if you have plants that have become thin or leggy. In some cases, a lack of sunlight can cause thin and leggy plants, particularly towards the base. By pruning out one third of the branches down towards the inside and base of the plant, more sunlight is allowed into plant, and will stimulate new growth from the inside to the outer portions. Sounds kind of counter-intuitive, right? Thinning works really well on plants like wax myrtle, holly, forsythia, nandina, red twig dogwood, privet………basically any shrub with a dense branching habit. Plants will grow from the point where they are pruned. By pruning down, inside the plant, we can fatten up a thin plant. Much like heading, removing up to one third of the growth of a shrub should be done if late February. Thinning can be done through spring and into summer, but avoid pruning in the fall months. Rejuvenation is a technique that is not for the faint of heart. It is easy to physically do, but it takes a bold and confident attitude to accomplish. Rejuvenation requires the use of shears, hand pruners, or even a chainsaw to completely remove all plant growth to within 3-6” of the ground. That is right…………cut down to the ground. Some plants need a fresh start after years in the garden and this is the easiest way to accomplish a new look without ripping out old plants and replacing them with new ones. Many of our deciduous shrubs like spiraea, butterfly bush, and vitex can withstand, and look much better after rejuvenation. I even rejuvenate my knockout roses every February to keep them dense and under the height of my mailbox. It is important to note that some plants to not respond well to rejuvenation. Old boxwoods, conifers, and plants that can be difficult to grow can be more safely thinned, or headed back. A lot of gardeners ask about what pruning paint is, and if they should use it. Pruning paint can be a tar-like or waxy substance that is applied to the wounds created by pruning. In theory, the paint helps the wounds heal faster. My personal opinion is to leave pruning wounds alone. Pruning paint never entirely covers or seals a wound. There are always pockets and voids between the paint and the plant that are the perfect environment for bacteria or fungus to live. These voids also create a great habitat for some insects. Leaving pruning wounds open to heal over themselves seems to be the best way to help out your trees and shrubs. This is pruning, in a nutshell. It is a quick rundown of a huge topic and I know that there will be many unanswered questions floating around. As always, feel free to email me with any questions you may have at fairviewgardencenter@gmail.com. Gardeners can achieve many different goals by heading back, thinning, or rejuvenation. Choosing the correct method of pruning and knowing when to prune is important to your garden. Regardless of how you choose to prune, remember to have fun doing it. Pruning does not have to be a chore………it can be art!